Our objective was to identify a serum-based protein biomarker of oval cell mediated BDH that could be incorporated into a clinical pathology panel. Our execution of this strategy began with gene expression analysis using microarrays to identify transcripts that were induced by compounds that cause BDH via a mechanism involving oval cell proliferation. Bioinformatic analyses were used to identify differentially expressed transcripts that encode a secretable protein. We then evaluated the specificity and sensitivity of these biomarkers by measuring their transcript and/or protein concentrations in livers of animals treated with compounds that cause BDH or other hepatotoxicities. BDH and minimize unrelated toxicological phenomena, combined with a strategy to increase the proportion of transcripts isolated from proliferating bile ducts and oval cells. Methapyrilene treatment of rats was selected as a model for BDH because it caused a moderate increase in BDH without causing extensive hepatocellular injury or inflammation that would complicate microarray analysis. Chronic treatment of F344 rats with methapyrilene produced marked proliferation of oval cells, severe BDH, and progression to cholangiocarcinoma (Jelinsky et al., 1980). Our goal was to identify early markers of this process. Rats were administered methapyrilene hydrochloride (MP) at 200 mg/kg at 0 and 48 hr and sacrificed at 96 hr. 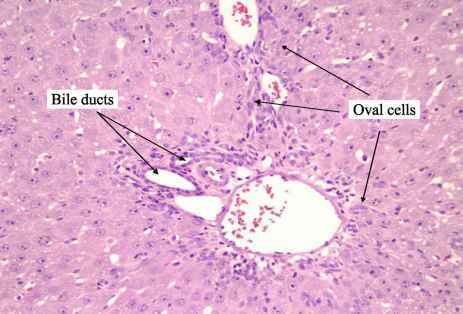 Histological examination showed oval cell proliferation and BDH, with some evidence of hepatocellular apoptosis, necrosis, and inflammation (Fig.1). In order to minimize the contribution of hepatocytes to the gene expression profile, a collagenase perfusion technique was developed to remove the hepatocyte population. The technique is similar to that used to prepare primary cultures of hepatocytes, but instead of harvesting the hepatocytes, we retained the biliary tree for microarray analysis. In this way we enriched for biliary epithelial cells by eliminating ~80% of the wet weight of the liver due to loss of hepatocytes. Importantly, the bile ducts isolated using the collagenase perfusion were largely devoid of hepatocytes and had normal histology. Figure 1. Low magnification image of formalin-fixed, paraffin-embedded, H&E stained F344 rat liver showing proliferating oval cells. Rat was treatment with oral doses of methapyrilene hydrochloride at 200 mg/kg at 0 and 48hr and sacrificed at 96hr. Figure 2. Affymetrix data for two probe sets attributed to the ebnerin transcript on Affymetrix U34A arrays. RNA was obtained from collagenase-perfused livers of rats treated with vehicle or methapyrilene hydrochloride at 200 mg/kg at 0 and 48hr and sacrificed at 96hr. Data are the average of three hybridizations, one from each of three animals per treatment. Values from rat hepatocytes and whole rat liver are shown for comparison. to identify the fraction of transcripts that encoded proteins containing motifs typical of secreted proteins, and for which there was evidence for preferential expression in epithelial cells. One such transcript is called ebnerin (Fig.2). Ebnerin is expressed in secretory duct epithelial cells of the von Ebner gland (VEG) of the rat tongue (Li and Snyder, 1995). It is a large protein (170 - 210 kDa) that contains repeats of two protein domains, SRCR and CUB, with high homology to secreted proteins and transmembrane receptors, respectively. The VEG secretes many proteins and other biological molecules into the lumenal surface along the apical region of taste buds. Of interest to us was the observation that ebnerin was detectable in secretions from VEG (Li and Snyder, 1995), human tear fluid (Schulz et al., 2002), and in the medium of cell cultures (Sasaki et al., 2002). In earlier studies, ebnerin transcripts were not detected in rat tissues other than tongue, including liver, lung, kidney, colon, testes, brain, and spleen (Li and Snyder, 1995). However, it is common that transcripts and proteins that are first identified under one experimental condition are later discovered to have additional structures and functions in other tissues and other biological processes. 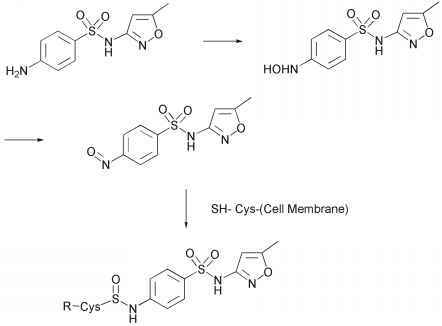 We therefore considered it a possibility that ebnerin could be made by, and secreted from, oval and/or biliary epithelial cells, and as such might be detectable in serum and/or GI contents of animals treated with compounds that cause BDH through oval cell proliferation. Figure 3A. Location of TaqMan primer/probe sets designed to discriminate between ebnerin and DMBT1 transcripts. The probe set at the 5' end of the gene will detect DMBT1 but not ebnerin. The probe set at the 3' end of the gene will detect both DMBT1 and ebnerin. Figure 3B. Quantitation of transcript levels for ebnerin and DMBT1 by TaqMan analysis of livers from rats treated with vehicle or methapyrilene hydrochloride, as described in Fig.1A. CT values were comparable between the two primer/probe sets for animals treated with vehicle and methapyrilene hydrochloride. Examination of the primary structure of ebnerin transcripts in GenBank and the published literature helped us deduce that a group of transcripts encoded by the same gene had been studied in different species under different names, including ebnerin, gp340, hensin, CRP-ductin, and DMBT1. The transcripts varied significantly in size from 4.5 to 8 kb as a function of species, tissue, and stage of biological development (Mollenhauer et al., 2001). Splice variants lacking exons at the 5' end of the transcript were identified as a distinguishing feature of the ebnerin transcript. QPCR using TaqMan® can be used to distinguish subtle variations in nucleic acid sequence (Li et al., 2004). We therefore designed two sets of TaqMan® primers and probes to quantify two different regions of the transcript: one for an exon toward the 5' end of the transcript and one for an exon toward the 3' end. Of these two exons, only the 3' exon is associated with ebnerin transcripts, whereas both exons are associated with DMBT1 transcripts (Fig.3A). Similar levels of expression were observed for both exons (Fig.3B), demonstrating that the livers of both vehicle and MP-treated rats primarily expressed a transcript that is more properly named deleted in malignant brain tumor 1 (DMBT1), than ebnerin. fold). This points to tradeoffs related to the use of microarrays. The single hybridization procedure that permits detection of thousands of transcripts requires that we accept decreased accuracy and narrower linear dynamic range for individual transcripts. Complementary techniques, such as TaqMan®, are therefore used in parallel with microarrays to improve qualitative and quantitative assessments of individual transcripts.